New Pampers Diapers Coupons Plus Target, Walgreens And Rite Aid Deal Ideas! There are two great new Pampers coupons available today!$3 Pampers Swaddlers Diapers coupon ($3 off one box or $3/2 bags) $3 Pampers Cruisers Diapers coupon ($3 off one box or $3/2 bags)We have tons of ways to use these coupons through 2/6, so here's what you can do:Walgreens Pampers … [Read more...] about New Pampers Diapers Coupons Plus Target, Walgreens And Rite Aid Deal Ideas! 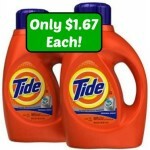 New Tide Detergent Coupon Means Bottles As Low As $1.67 At CVS, Walgreens, Target & Rite Aid! There is a fantastic new $2 Tide Detergent coupon available today! This is good only on the 37 oz or larger liquid detergent. Tons of stores have Tide on sale this week, so here are some ideas for you:CVS (through 1/30) Buy 6 Tide Detergent 37-50 oz $5.34 each ($32.04) Use 4 $2 Tide Detergent … [Read more...] about New Tide Detergent Coupon Means Bottles As Low As $1.67 At CVS, Walgreens, Target & Rite Aid! New $2 OxiClean Detergent Coupon Plus Walgreens, Walmart And Rite Aid Deal Ideas! There is a great new $2 OxiClean Detergent coupon available today! This coupon never lasts for long, so grab yours while you can! There are lots of ways to use this, so here is your list:Walgreens (through 1/23) Oxiclean Liquid Laundry Detergent 20 - 26 loads $3.99 Use $2 OxiClean Detergent … [Read more...] about New $2 OxiClean Detergent Coupon Plus Walgreens, Walmart And Rite Aid Deal Ideas! New Pampers Coupons Plus Kmart, Target And CVS Deal Ideas! There is a great new $1.55 Pampers Baby Dry Diapers coupon available today! There are tons of ways to use this, so here are some ideas for you:Kmart (through 1/9) Pampers Diapers Giant Pack $33.99 Use $1.55 Pampers Baby Dry Diapers coupons Final Price: $32.44Target (through 1/9) Pampers … [Read more...] about New Pampers Coupons Plus Kmart, Target And CVS Deal Ideas! New Pampers And Luvs Diapers & Wipes Coupons Plus Deal Ideas! There are a bunch of new Pampers and Luvs coupons available today!$1.50 Pampers UnderJams Absorbent Night Wear coupon $1.50 Pampers Easy Ups Training Pants coupon $1.55 Pampers Baby Dry Diapers coupon $.75 Luvs Diapers coupon $1 Pampers Wipes coupon $.50 Pampers Wipes couponThere are … [Read more...] about New Pampers And Luvs Diapers & Wipes Coupons Plus Deal Ideas! Walgreens Agrees To Buy Rite Aid! Well here's a development! Walgreens has agreed to buy Rite Aid for 9.4 billion dollars. As of right now, everything is staying the same. Don't be concerned that your beloved Walgreens or Rite Aid store won't be there waiting for you tomorrow! But what will this mean for us? It's anyone's guess. 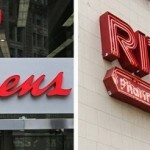 … [Read more...] about Walgreens Agrees To Buy Rite Aid!